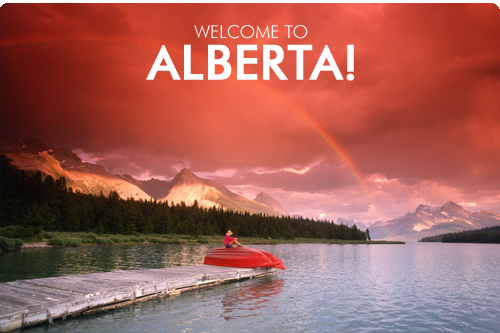 BBCanada.com | Welcome to Alberta! There’s no better way to experience Alberta ‘up close and personal’ than by staying at one of the 165 unique members of the Alberta Bed and Breakfast Association (ABBA). ABBA is a not-for-profit association whose purpose is to further the bed and breakfast industry in Alberta by promoting high standards, cooperative marketing and government liaison. When you stay with an ABBA host, you are staying with the best! Whether your visit is for business, vacation or a relaxing getaway, there is a bed and breakfast that can satisfy your needs. You can choose from historic or modern homes in our urban centres, private country homes, cabins or ranch like settings in our vast rural areas or guest houses, luxury inns and cottages in our mountain parks regions and throughout the province. Small, intimate, quaint, romantic, modern, luxurious, rugged, mountainside, private, social, elegant, formal, casual, peaceful, economical, deluxe, hearty breakfasts, pet-friendly, family-oriented, engaging hosts, whatever your style, Alberta Bed & Breakfast Association has it for you. Above all, you’ll be assured of high standards of quality, professionalism and the warm western hospitality that Alberta is known for. Alberta is the land of the fast and furious good time. Whether you’re on a seven day fat-tire mountain bike race, swooshing down a white-knuckle stretch of whitewater, or hurtling down a zip line in the footsteps of Olympic athletes, it's a wonderful wild ride. Discover where the sidewalk ends and your adventures begin in Wild Rose Alberta. You can roam where the dinosaurs did, find yourself in Canada’s oldest spa – which sparked our National Parks’ system – and explore UNESCO World Heritage Sites. Leave your worries behind and get ready to smile, smile, smile. Alberta covers 660,965 sq km (255,200 sq mi) or roughly three times the size of Great Britain. Here are some 50 great getaways around the province. Go ahead, just scan and plan. And at the end of this story, you’ll find a list of some of our favourite attractions. 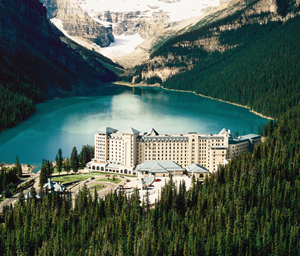 Lake Louise Mountain Resort was awarded the top spot in the categories of “Best View from the Slopes,” “Best Steeps,” “Best Scenery,” “Best Blast from the Past” and “Most Romantic Accommodation”—Special Winter edition of Ski Canada Magazine (2002). 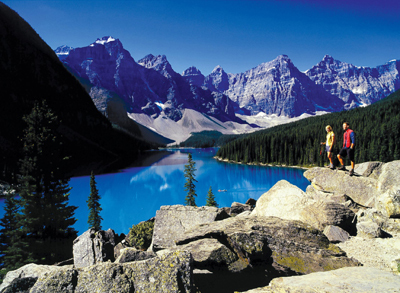 Canada’s National Parks system began in Alberta with the creation of Banff National Park in 1885. Today we have five National Parks, with Wood Buffalo in the far North being the world’s largest park (the size of Switzerland). It’s also home to the largest herd of free-ranging bison on this planet. 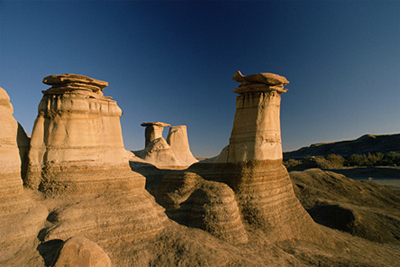 Alberta claims five of Canada’s 13 UNESCO World Heritage Sites. One of the most scenic drives on this planet is right here—The Icefields Parkway—littered with more than 100 glaciers that form an icy rooftop on the world. The 230 km (143 mi) classic stunner runs from Lake Louise to Jasper and is also a popular route with cyclists. In Northern Alberta, on the fringes of Fort McMurray, you’ll find the Athabasca Oil Sands, the largest oil deposit in the world. In fact, it equals the combined land area of Florida and South Carolina. The world’s biggest tenants left their gargantuan tracks all over the Canadian Badlands. 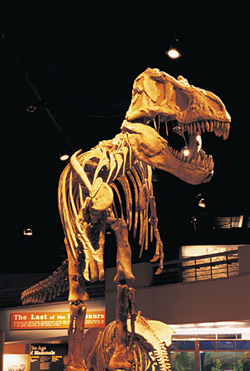 You can join a camp (for kids as well as one for families) or tour the world’s largest collection of dinosaur fossils in the Royal Tyrrell Museum in Drumheller. Alberta contains half of Canada’s sand dunes. Just south of Alberta’s oldest settlement, Fort Chipewyan, is one sand dune that is 7 km (4.3 mi) wide and 13 km (8 mi) long. It’s moving at a rate of 1meter (3.2 ft) per year. The Frank Slide Interpretive Centre, in the Crowsnest Pass, tells the remarkable geological story of how 30 million cubic metres of limestone ripped down Turtle Mountain on April 29, 1903. 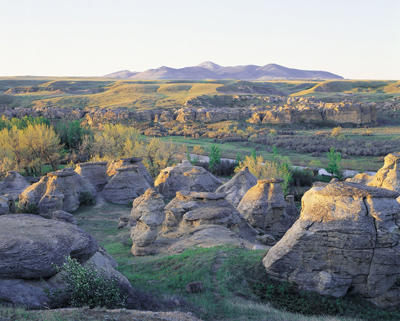 Etched in the sandstone cliffs and hoodoos of Southern Alberta’s Milk River valley, are pictographs and petroglyphs at Writing-On-Stone Provincial Park that date back more than 2,000 years. 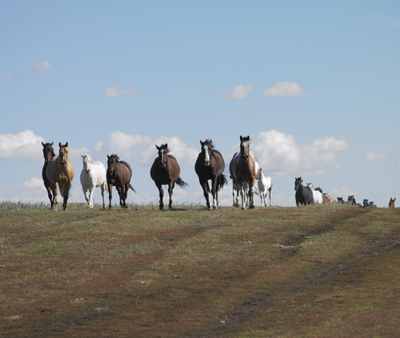 The Cowboy Trail was recently selected in a publication as one of Canada’s 13 Best Drives by Toyota Canada. It runs 640 km (398 mi) from Mayerthorpe, just northwest of Edmonton, to its southern terminus in Cardston, near the U.S. border. 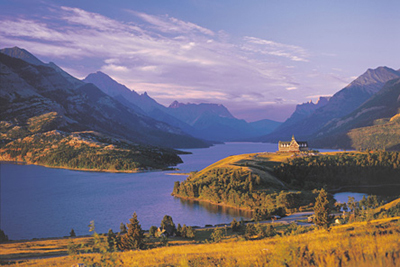 The Trail of the Great Bear in Waterton National Park was awarded the “Tourism Watershed Award” by the United Nations International Year of Fresh Water & Wonder of Water Initiative in 2004. Fort Macleod’s 'Main Street' is designated the only Provincial Historic Area in Alberta. 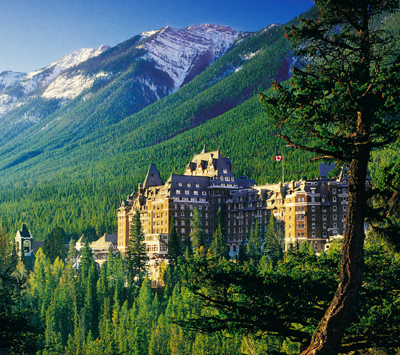 The Fairmont Banff Springs received the Platinum Award from Celebrated Living Magazine, recognizing its Willow Stream as one of the top international spas. Alberta’s first fruit winery, the Fieldstone Fruit Wine Company near Strathmore, is ready for you. The largest classic cross-country ski race in North America is the Canadian Birkebeiner, held near Edmonton every February. Its 55 km (34 mi) track is modeled after the Norwegian rescue effort that took place in 1206. The longest hole on any Canadian golf course is at The Nursery Golf and Country Club in Lacombe. The 782 yard, par 6 11th hole is a straightaway monster that forces golfers to cross the courses’ irrigation pond at the 400 yard mark. It’s one of only two official par 6 holes in the country. The Post Hotel, a member of the prestigious Relais & Châteaux Association since 1991, has been recognized as one of the world's best by both Travel and Leisure Magazine and Condé Nast Traveler Magazine. Travel and Leisure, a popular lifestyle magazine, highlighted the Post Hotel as the highest rated Canadian Ski Resort in its 2004 edition of the 500 Greatest Hotels in the World. Condé Nest Traveler included the exquisite Post Hotel on its 2004 Gold List of the World's Best Places to Stay. Lake Louise's Skoki Lodge was recently rated in the 'Top 10 Winter Hideaways' by National Geographic Adventure Magazine. This hike-in/ski-in lodge sits at 2,400 m (7,100 ft) in Banff's high alpine region. "It is surrounded by five valleys, more than a half dozen lakes and striated peaks,” the magazine adds. The Travel Channel crowned West Edmonton Mall “the most entertaining place to shop” in North America. The world’s largest shopping centre beat shopping locations in Los Angeles, Las Vegas and Beverly Hills. Alberta’s No. 1 tourist attraction was featured on the U.S. television show Top Ten Shopping Heavens on the Travel Channel. 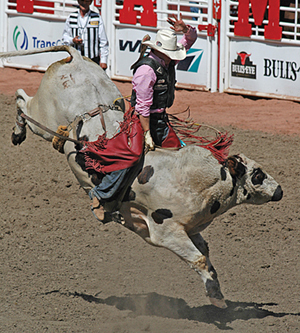 The Canadian Finals Rodeo (CFR), held every November in Edmonton, is regularly named by the American Bus Association as one of North America's top 100 annual events. In Banff, the Banffshire Club, in the Fairmont Banff Springs, and the Eden in the Rimrock Resort were awarded the prestigious 5-Diamond award by Triple A (AAA), a rating held by only seven other restaurants in Canada. Golf Digest awarded the Banff Springs’ Stanley Thompson Golf Course with 4½ stars for service excellence and overall golf experience. In 1981, the Edmonton Fringe Theatre Festival was born, becoming Canada's first and still the country's largest. The World’s Largest Dinosaur in Drumheller won an Attractions Canada award in 2001 in the Leisure and Amusement Centre category. The Crowsnest Pass was named best overall snowmobiling area in Western Canada in SnoRiders West magazine. One of Canada’s coolest neighbourhoods is Edmonton’s Old Strathcona, according to en Route magazine. The Santa Claus Parade in Fort Macleod is the biggest and best Santa Claus Parade west of Toronto, with more than 80 floats participating and over 8,000 people attending in recent years. Big Sky Garden Railway in Nanton is Canada’s Biggest Garden Railway. The biggest trout ever hauled out of a lake was from Alberta’s third-largest lake, Cold Lake (home of Canada’s largest airbase, as well). Nearby is Marie Lake, which holds the bourbot record for Alberta. The world’s largest ecomuseum, the Ukrainian Cultural Heritage Village, (UCHV) reflects Western Canada’s largest Ukrainian and East European pioneer settlement. has been recognized once again by the Alberta Therapeutic Recreation Association for its highly successful “Special On-Site Driving Tours for Mobility-Impaired Seniors” program. Just east of Edmonton lies Lamont County, church capital of North America, with more than 47 historic churches. The Lake Louise area in Banff National Park was the birthplace of mountaineering in the Rockies, and it boasts a number of storied peaks. Many are scaleable (advisable with a guide) such as 3,700 m (11,362 ft) Mount Victoria. Canada’s version of the Haute Route is right here in Alberta, known as Banff’s Wapta Icefield. Nights are spent in some of the Alpine Club of Canada's most comfortable huts and trips can be organized through private guides or with the Alpine Club. Push your limits in one of the toughest running races around. Dubbed the Canadian Death Race, this 125 km (77.6 mi) mountain race in Grande Cache will see participants go flat-out over mountains and across rivers (lots of ‘em!) during the August long weekend. Or, if you’d rather, you can just sit back in a lawn chair and cheer these extreme racers on. Poke around North America’s largest collection of horse-drawn vehicles, at the Remington Carriage Museum in Cardston. Birders, grab your scopes in May or June and head to the northern city of Grande Prairie to spy trumpeter swans. Kick up your heels, grab your frilly skirt and cowboy boots and join in with scores of other tourists who flock to Hillspring’s Great Canadian Barn Dance, held every weekend during the summer. This event recently snagged a “Top 10 Things to Do in Alberta” award from RV West Magazine. Rent a bike in Calgary and explore Canada’s longest web of continual bike paths, totaling 460 km (287.5 miles). Try out the harness zipline at Canada Olympic Park and fly down the hill at speeds of up to 140 km (87 mi) per hour. Feel time move beneath you on a 6 km (3.7 mi) chunk of ice known as the Athabasca Glacier, one of the six major glaciers that make up the Columbia Icefield. A specially designed Ice Explorer takes you on a guided tour to the glacier which is measured at between 90 m (270 ft) and 300 m (1000 ft) thick. “The Greatest Outdoor Show on Earth,” The Calgary Stampede, is where you can pony up to the bar with rootin’ tootin’ cowboys for 10 sun-drenched days every July. ‘I scream, you scream, we all scream for ice cream’—hear that chant every summer when folks line up for a double scoop of heaven at MacKay’s General Store in Cochrane. On a record-breaking day, 4,500 cones were sold, most of which were doubles. Tired of trendy, pricey bakeries? Just want an old-fashioned, gooey cinnamon bun? Then check out the province’s largest version (the size of dinner plates) at That’s Crafty, just outside of Rosebud, near Drumheller. Another great bakery worth noshing at is the one at Calgary’s Heritage Park Historical Village. Others include the Old Fashioned Bakery in Smoky Lake, Countries Memories in Radway or Koko’s Bakery in Andrew. Did you know that Alberta clocks about 2,000 hours of sunshine a year? It ties with Saskatchewan for sunniest province in Canada. 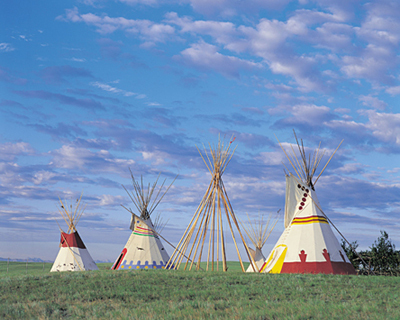 Want to sleep in a cozy authentic teepee? 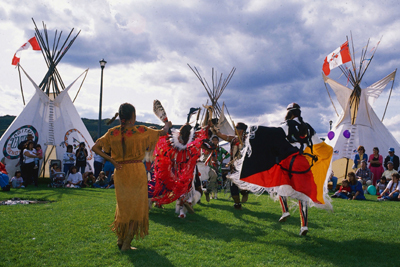 Do so at the base of the UNESCO site, Head-Smashed-In Buffalo Jump, and with Eagle Spirit Cultural Programs near Elk Island National Park, 30 minutes east of Edmonton. Everyone has their own favourites, but here’s our "first fifteen" to get you started.